Thanksgiving is one of those times of year that I think people try a little harder to set a beautiful table. 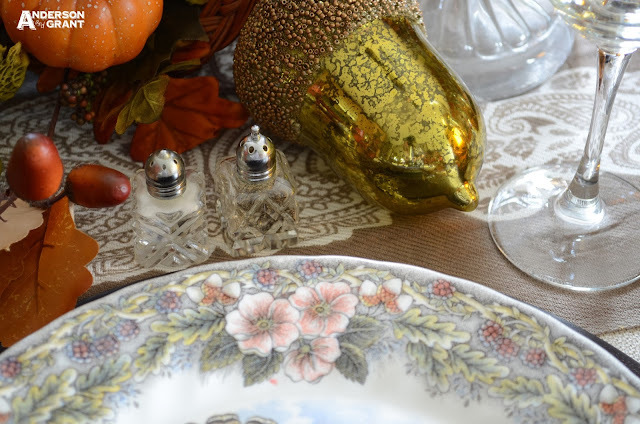 As I said with my fall tablescape, one of the ways you can make your dinner guests feel welcome is to put a little extra effort into setting a beautiful table. 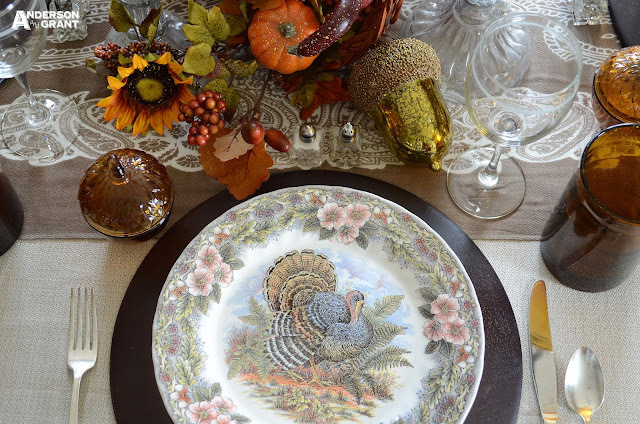 Rather thank just show you my Thanksgiving table, I thought you might enjoy seeing the steps I take to create a tablescape. 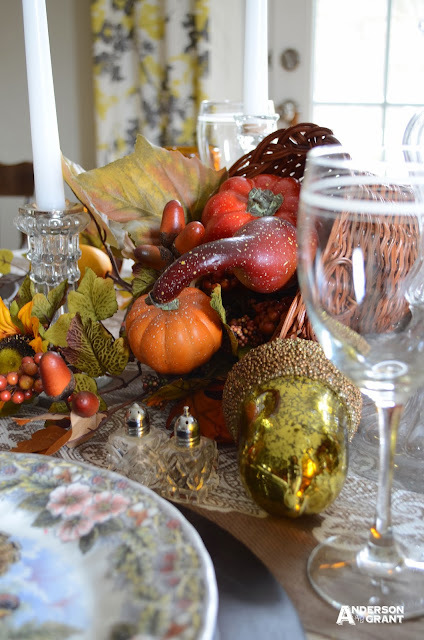 The easiest way to create a tablescape is to have a particular theme (like Thanksgiving) or color scheme in mind. This gives you a little bit of direction as to what should be included on the table. I love layers and mixing and matching, whether it is your fabrics, your dishes, or your centerpiece. As long as everything sticks to the theme or color scheme that you picked out, things go well together. The base of your entire table should be some type of fabric. You can use a tablecloth, a runner, or in my case, both. This is the best and easiest way to incorporate a little color, texture, and pattern into your table. And you don't necessarily need to use a real tablecloth or runner. Think outside the box and use a piece of fabric from the craft store, a blanket, a rug...the list is endless. 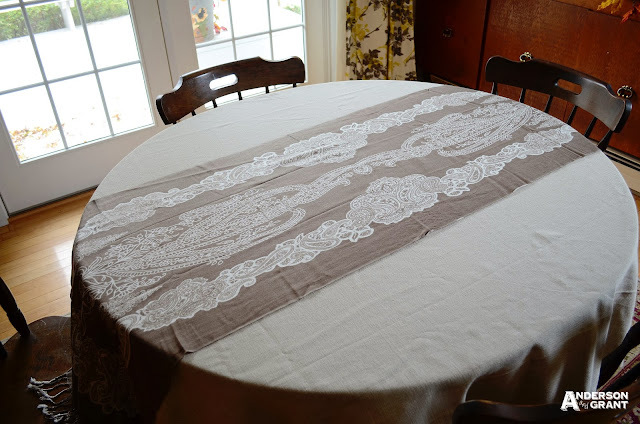 For my table, I'm using a scarf that I purchased at Payless Shoe Source as my tablerunner. It is a great neutral color and I loved the fringe on the ends. On top of the fabric layer, place your dishes, glasses, and silverware. Using a mix of colors, patterns, and shapes adds a lot of interest to the look of your table. 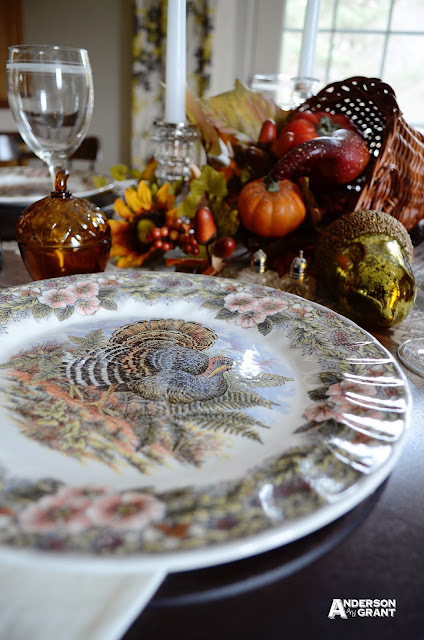 For Thanksgiving, I'm using a vintage reproduction turkey plate on top of a wooden charger. I've also tucked monogrammed fall napkins underneath the plates. I love how they kind of fall down the sides of the table. For glassware, I used a clear wine glass paired with a brown drinking glass. 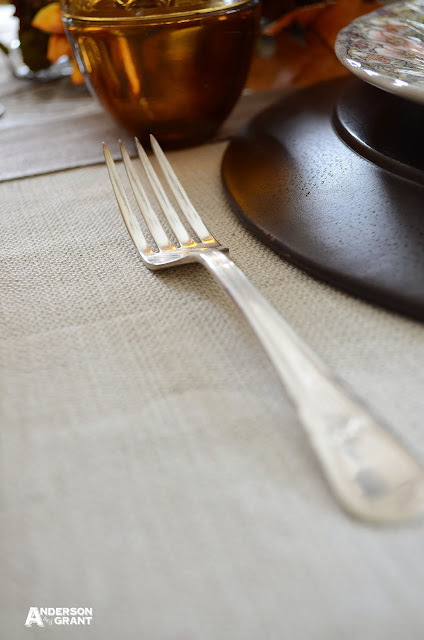 Once again, I'm using vintage silverware that has been passed down through my family. After placing the dinnerware, add your centerpiece and light. Every table should have a showstopper and that normally is the centerpiece. It is your chance to really add something to create interest on the table. 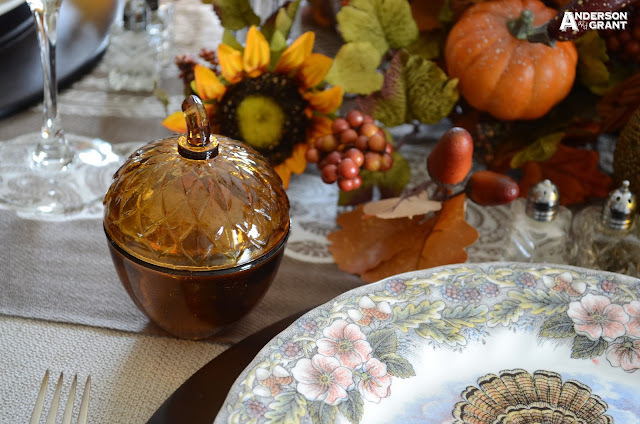 I used a cornucopia filled with a fall swag from Hobby Lobby. Then I tucked in a few mercury glass acorns. Your showpiece could also be amazing dishes, and if that is the case, your centerpiece should be toned down. Too many things to catch the eye will make the table look overwhelming. Every table should also have some form of light, typically candles. (Avoid scented candles, though, as the scent can interfere with the taste of your food). You could also layer a mirror underneath the centerpiece to reflect the light from above. There should be something personalized for your guests, whether it is a place card with their name on it or a little "gift" they can take home with them. I purchased these glass acorns that my guests could take. The acorns could also have a name tag attached to the stem and be used as the place card! 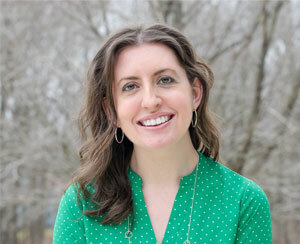 Your table needs to be "guest-friendly"
Make sure that your table setting is "guest-friendly." There are a large number of tablescapes out there that look amazing, but aren't really functional when it comes to sitting down to a meal. 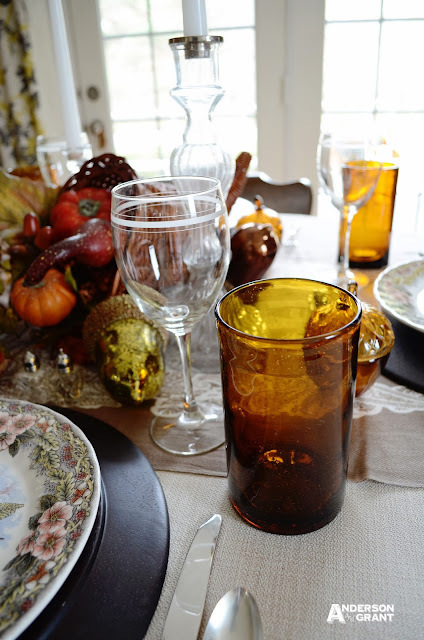 Your centerpiece needs to be low enough that guests can see each other from across the table. There should be enough space around the guest's plate area so that they are not bumping into things. Things like butter and salt & pepper should be easily accessible to each guest so that they don't have to ask for something to be passed to them. I like to use these great mini salt and pepper shakers placed at each place setting. Your guests will be sitting around the table, so make sure that it is looks good from all angles, not just the angle your creating it from. 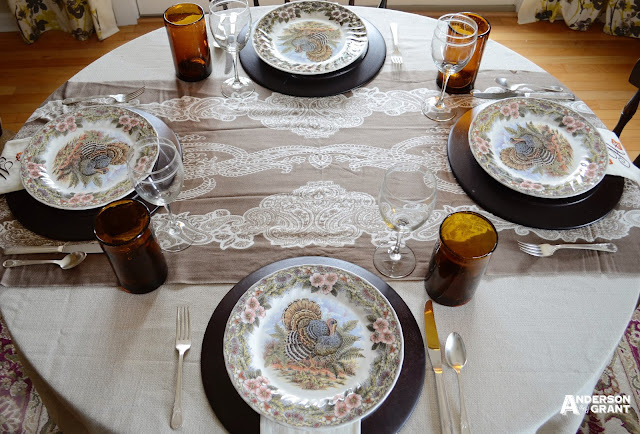 Take a moment to walk around the table and see what your guests will be looking at and adjust something if necessary. The back side of my cornucopia looked pretty boring. I added another tiny pumpkin and a few mercury glass acorns to make the other side a little more interesting. Height makes your eyes move through the whole tablescape. This is normally accomplished with the centerpiece (probably your candles), but even using chargers under your plates adds some height to the table. You just don't want your table to look flat with only dishes and glasses on the same level. What I think is the most important thing to remember when designing your table is that it might not look exactly right when you first lay it out. Don't be afraid to move things around until they look right to you. Try and experiment until you find something that you like. Exchange dishes. Change tablecloths. Adjust your centerpiece. Find what makes you happy. And while this may seem like a lot to remember each time you set the table, know that you don't have to follow all these steps every time. Try incorporating a few of the suggestions and see what you think. 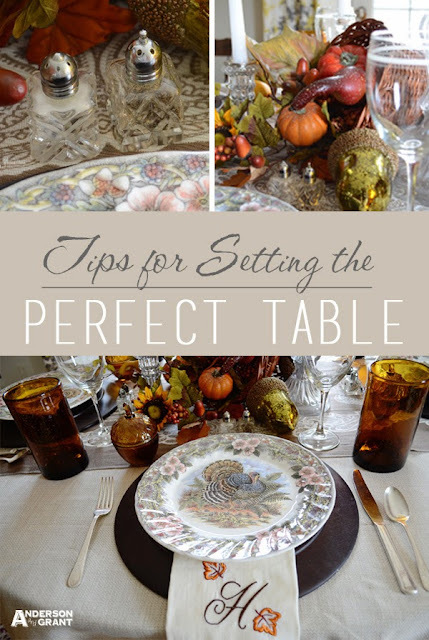 I hope this has given you a few ideas of how to set your table this Thanksgiving!!! !